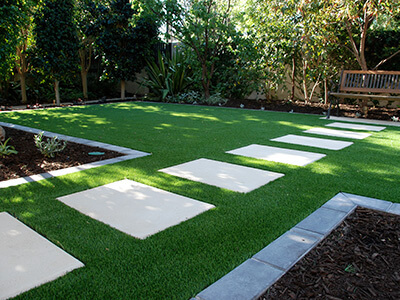 Artificial grass is a perfect alternative for natural grass on the subtropical coast of Queensland. 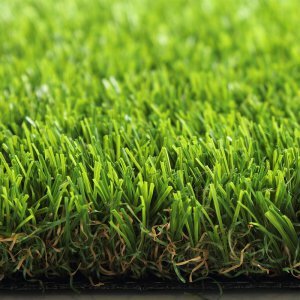 When you are looking to buy artificial grass in Brisbane or Sunshine Coast, you can go to Hills and Plains Landscaping. 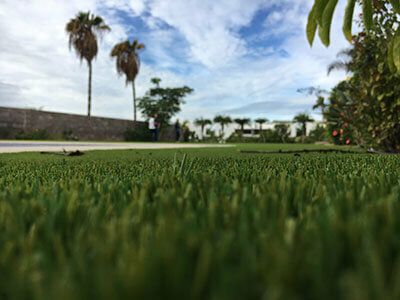 The official dealer of Royal Grass® and delivers and installs artificial turf of the highest quality. Royal Grass® artificial grass is one hundred percent safe, environmental-friendly and can hardly be distinguished from natural grass. For many years, Hills and Plains Landscaping has been responsible for designing and landscaping gardens in the southeast of Queensland. Over the years, this professional garden expert has executed numerous small-scale projects in the surrounding of Brisbane and Gold Coast / Sunshine Coast. Examples include landscaping lush and tropical gardens of residences, but also prestigious projects such as the garden design of Shark Bay, Sea World and Sovereign Islands in Gold Coast. 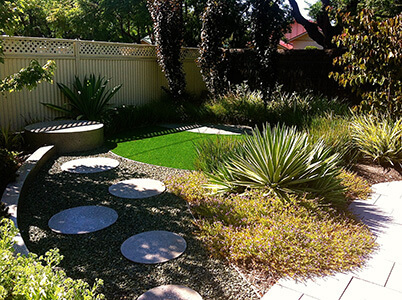 As a garden designer, Hills and Plains Landscaping has been using artificial grass for many years. In addition, the company has specialised in garden restoration, paving, retaining walls, water features, pool coping, pruning, fencing, synthetic turf and roll down turf. Brisbane and Sunshine Coast have a warm, subtropical climate, where it is relatively dry for a large part of the year. In such a climate, it is difficult to maintain a garden with natural grass. During dry spells, the lawn needs to be watered. This costs a lot of water and money. Furthermore, this requires a sprinkler installation for large gardens. The summers, on the other hand, can sometimes suffer from heavy showers that cause the grass fields to become flooded in no time. As a result, the grass can become useless and will sometimes even need to be replaced. Artificial grass is a good alternative for natural grass. It does not need any water and is resistant against too much sun and drought as well as heavy rainfall. Artificial grass stays green all year round and hardly requires any maintenance. You never have to water the grass and it does not need to be mowed of fertilised. Furthermore, artificial turf has a lifespan of many years. For this reason, the costs of artificial grass in the long run are very reasonable. Thanks to the nice and warm weather and the splendid beaches, Brisbane and Gold Coast are popular among tourists. Especially surfers love this area. Artificial grass is also very suitable for hotels. 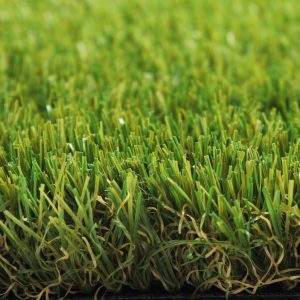 Unlike natural grass, artificial grass can be used all year round and can withstand intensive use. Moreover, it can easily be installed on a roof terrace or be used for a bar or restaurant. 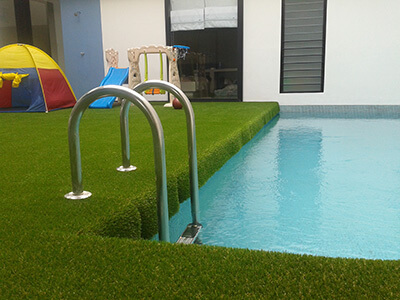 Artificial grass will not discolour due to sunlight, water or chlorine and will not become soggy making it ideal for a lawn next to a pool. 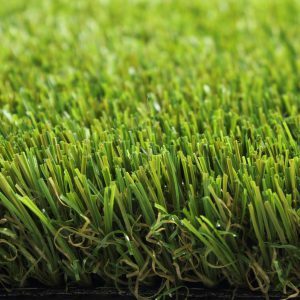 Are you looking for artificial turf in Brisbane, Sunshine Coast or one of the other cities in the southeast of Queensland? Hills and Plains Landscaping sells Royal Grass® artificial grass and can provide you with sound advice and help you find the right type of artificial grass for you. In addition, Hills and Plains Landscaping can install the artificial grass for you, so you do not have to worry about the installation either.